Free download AppLock Face Voice Recognition for Android with APK file latest version. AppLock makes it easy to secure other apps on your phone or tablet, ensuring that only you have access to your personal information, your social media apps, and even your financial accounts. Your face and voice are the biometric keys to let you (and only you) in. In just a few seconds, you can enroll both your face and voice by simply looking at the phone while speaking the passphrase at the prompts. Choose which apps you want to lock, and you’re done. The next time you open one of those apps, AppLock will pop open a window looking for your face and listening for you to say your passphrase, after which it will quickly confirm your identity and allow access into the app. AppLock is powered by Sensory’s TrulySecure multimodal biometric authentication technology, which combines powerful speaker verification and face recognition algorithms to ensure a robust and secure experience. We hope you find AppLock to be very intuitive and easy to use, both for setup and unlocking other apps. Here are a few hints that might help you along the way. Upon opening AppLock for the first time after installation, you will be guided through the basic configuration steps with our setup wizard. 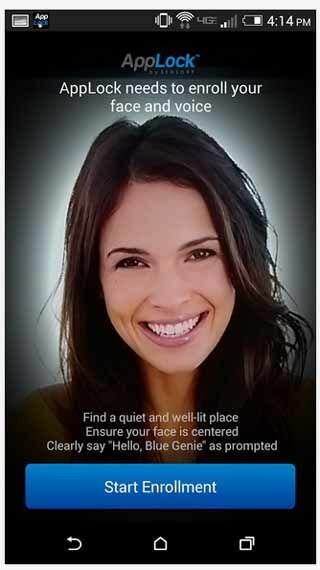 Just follow the process to enroll your face and voice, select a backup authentication method, and select which apps you would like to lock, and that’s it.As noted in the enrollment screen, it is important that you find a quiet and well lit location in which to perform the enrollment this will greatly enhance the accuracy. During enrollment you will be prompted to say the passphrase Hello, Blue Genie three times. Please speak clearly, with brief pauses between each phrase until you see the next prompt. If the system misses any of the attempts, it will continue to prompt you until it has three valid entries. You will also be asked to create a backup authentication option, which can be either a pattern, PIN or password. In situations where it is too dark or too noisy to successfully authenticate yourself, you will be able to use this backup method to gain access. You can always return to the app later to change which apps are locked, or to modify other app settings. Liveness. you can turn on liveness detection in AppLock itself under Settings for greater security. Turning this on prevents an impostor from trying to gain entry to your apps using a photo of your face. When turned on, liveness detection will require you to move your face a small amount, which can be achieved by simply moving your head back and forth slightly, or sometimes just speaking your passphrase will suffice. Data uploading. while AppLock performs all authentication directly on the device, some image and audio data are logged to Sensory servers to help us improve our algorithms. This is done only when the phone is on a Wi-Fi network to avoid using up your data plan, and can be turned off in AppLock under Settings. When this is turned off, AppLock will continue to upload performance statistics only (e.g., success or failure of authentication attempts) to Sensory’s servers. There is a known issue on Note 3 devices. Therefore AppLock is unavailable for this device. We’re working on a fix. Please check back soon.